Serta iComfort Blue 300 Mattress - A Good Fit For You? Home » Serta iComfort Blue 300 Mattress – A Good Fit For You? Serta iComfort Blue 300 Mattress – A Good Fit For You? In 2017, Serta re-engineered and re-imagined their iComfort mattresses and bedding sets. 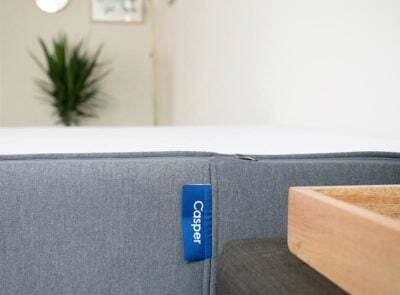 Now it includes a series of memory foam mattresses that blends layers of different types of memory foam with cooling technology. The standard line of memory foam mattresses is the Blue series and the firmest model available is the Blue 300. It features exclusive Deep Reaction™ Memory Foam that really helps give it that extra boost of support. Read on for our full review of the Blue 300 model and the additional features it provides. The Serta iComfort Blue 300 Model is 11.25″ thick, with a blue and white TempActiv™ Touch Cover on the outside of the mattress. Plus, there is a support system of 7” Serta® Ultimate Edge® Foam Core inside the mattress. You sleep hot. The layer of EverCool® Fuze™ Memory Foam should remain cool while you are sleeping, and the surface of the Serta TempActiv™ Gel Memory Foam contains phase change materials (PCMs). These take heat away from your body throughout the night. You sleep on your stomach. The firm mattress will give your spine and lower back the proper support you need and will stop your spine from arching or falling out of neutral alignment, which is known to cause stiffness. You want to get as close to the edge of the bed as possible. 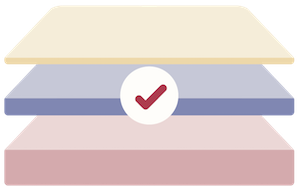 The last 7″ of the mattress are made with Serta® Ultimate Edge® Foam Core, which features enhanced edge support. This helps limit the feeling of “rolling off” the bed (which is common in foam beds) and allows you to maximize your room to stretch out. It’s tough for you to get in and out of bed easily. 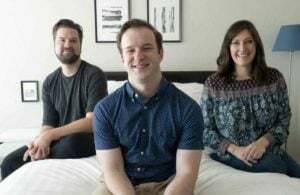 Because memory foam is designed to conform to your body’s shape, some people may feel a “sinking” sensation and not be able to get up very easily. You sleep on your side. 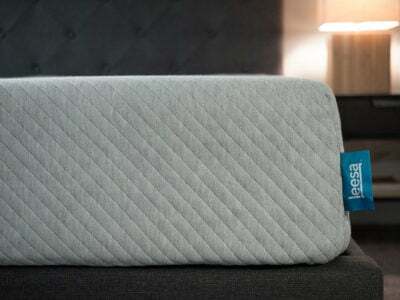 Since this is the firmest mattress option of the whole series, it’s going to be a better fit for stomach sleepers, who need that extra support to keep their backs aligned. Side sleepers put pressure on their hips and shoulders while they sleep and tend to need something plusher and pressure relieving. Because of the movement isolation, buyers say they are no longer disturbed by their partner tossing and turning at night. The cooling features provided by the EverCool® Fuze™ Memory Foam mean that lots of buyers no longer wake up sweating at night, or experience overheating. The firm mattress can be great for supporting your spine and joints, which many people said led to a reduction in lower back or spinal pain. The layer of Deep Reaction™ Memory Foam adds a “deep down” feeling that many users enjoy. If you don’t want something really firm, the Serta iComfort Blue 300 may not be right for you — after all, it’s at the very top of the Serta firmness scale. Some brand-new Serta iComfort Blue 300 mattresses may have an odor, caused by “off-gassing.” Some of the buyers who reported an odor say it initially annoyed them, but the smell dissipated within a few days. Adding a mattress topper or another cover may cause problems with the Serta iComfort 300 cooling technology. 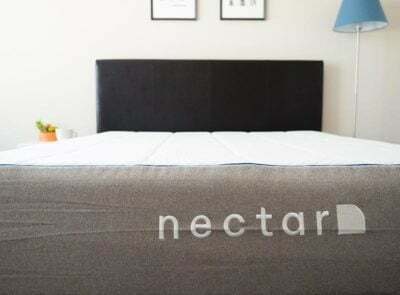 Some users say that adding a mattress topper caused them to overheat at night, but the issue went away when they subsequently removed the topper. 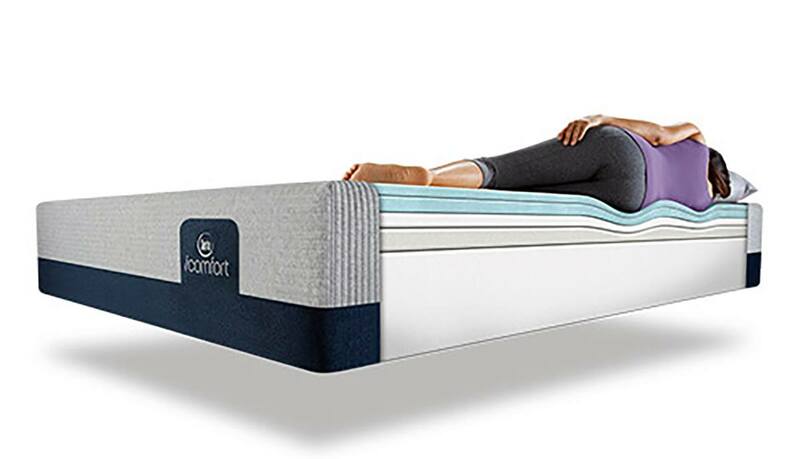 Why Pick This Over Other iComfort models? The Serta iComfort Blue 300 mattress is one of the more affordable options in the 2017 Serta iComfort Memory Foam Collection, starting at $1,399 for a Queen mattress. As such, it’s an ideal choice for people on a more limited budget. Based on reviews and feedback on the mattress, this seems to be a good fit for couples. The memory foam comfort layers on top help isolate motion so that sleep partners don’t feel each other move at night. The firmness of the memory foam also makes it an ideal fit for stomach sleepers who want plenty of support. The Blue 300 is the second most basic mattress in the 2017 Serta iComfort series (the Blue 100 is the most basic). It contains three layers of memory foam, one layer of support foam, and a foam core. The cooling features include a layer of TempActiv™ Gel Memory Foam, a layer of EverCool® Fuze™ Memory Foam, and a TempActiv™ Touch Cover. The bed is constructed well for those who prefer a very firm bed and those who sleep hot. The outer fabric should be cool to the touch. 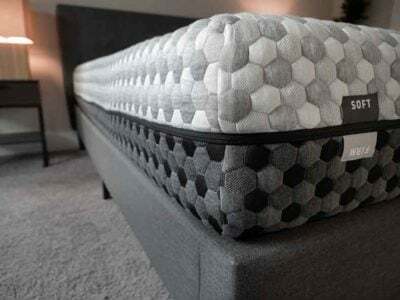 Couples also found the motion isolation to be great as well and the enhanced edge support means you should be able to take advantage of the whole mattress. All Serta iComfort series mattresses come with a 120-night in-home trial period. Check out our comprehensive review of the Serta iComfort memory foam series, here. 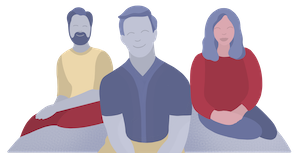 Katie manages the day to day operations of the Mattress Clarity news site and reviews sleep products in addition to writing and editing sleep news.She hails from Austin, where she lives with her growing family. She has a master’s degree in Journalism from Northwestern University and has a background in health and science content. Her work can be found in print and online publications like Discover Magazine, USA Today and The Huffington Post.